Performance Reviews | Nicole, Deipnosophist. Last time the Mummies were in town, I was carrying an extra human around with me, so I didn’t attend the show. I wasn’t going to miss this one! 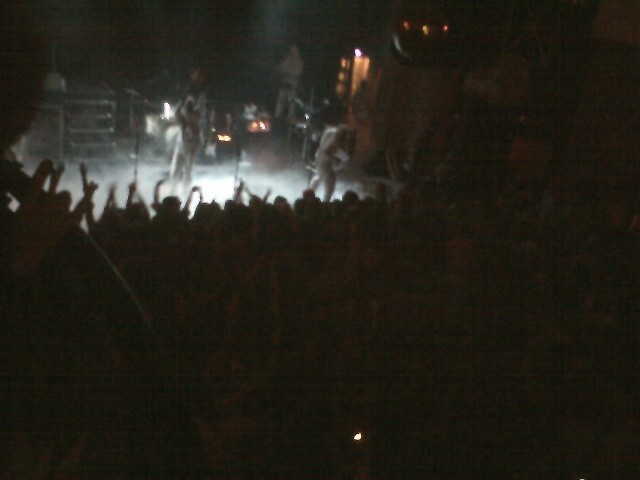 If you’ve never heard of the Mummies, they are a dynamic funk band with fantastic live shows. They are the height of kitsch: they not only sing every single song as a double entendre, they perform in full costume every time. I wouldn’t recognize them if they were out of their mummy garb! I never thought I’d like funk, but these musicians are great fun to watch and they are very talented as well. So we dressed up, found a babysitter, and headed to the Vogue. Our usual ticket connection guy was MIA. We called him on our way, only to find he wasn’t able to attend the show…for the first time in years. As we arrived at the Vogue, I saw a sad little sign that read “Mummies- tonight- Sold Out :).” Oh no! We didn’t even think of that! So we hung around outside hoping someone would have tickets. We weren’t the only ones. This guy and his I Dream of Jeannie date had elaborate costumes but no tickets. Groups of us loitered, hoping for the best. As we waited, some people in zombie costumes wandered past the Vogue. They were playing the zombie part very creepily. 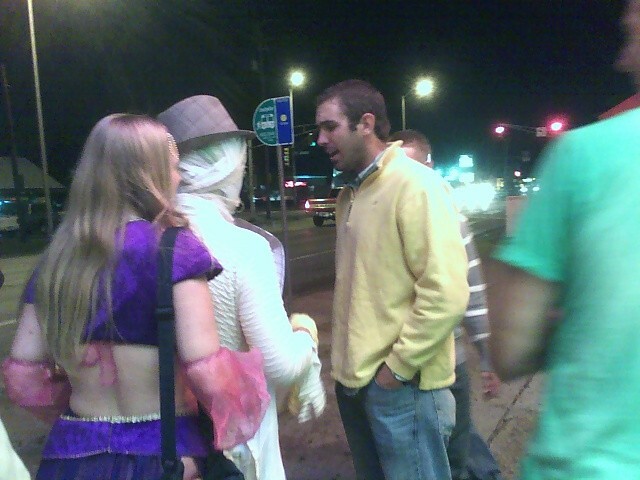 A minute later, a guy dressed as Michael Jackson (pre-plastic surgery and skin bleaching) wandered past. We joked he might break into Thriller. Then, about 20 yards past the Vogue, a car pulled up, opened its windows, and out blasted Thriller! 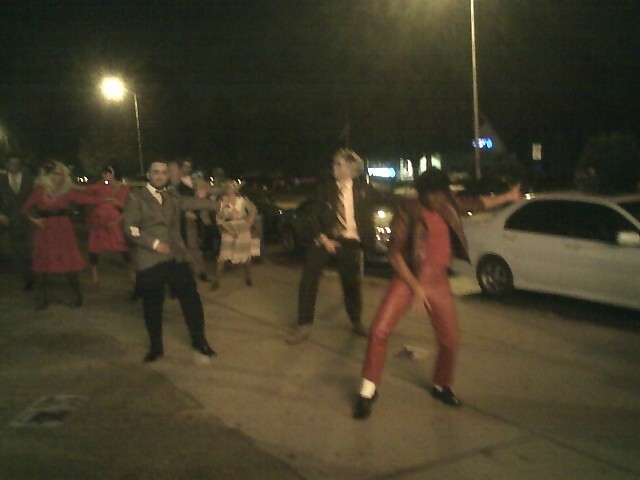 The zombies and “Michael” broke into the Thriller dance. It was hilarious and well done. Even some of the Vogue staff stopped by to cheer and clap. After the dancing finished, “Michael” announced that he had extra tickets! We cheered, rushed over, and bought two. A crowd clamored for the tickets and we all congratulated each other on our good fortune. We ran to the Vogue entrance as an entourage of ecstatic fans. The drumbeats of Do You Believe had just begun. We didn’t miss a thing! The performance rocked as always. The crowd sang every word, and fans who’d never met were singing to each other and the band. The costumes were wild (Michael and gang were just the beginning) and everyone was having a great time. It wasn’t their best show to date, but it delivered energetic funk in a great atmosphere. I’m glad to see that this band that used to play at the tiny, now defunct Patio is now packing the Vogue full. They announced that they’ll be rocking the Vogue on New Year’s too- a first- they usually play in Tennessee that night. Oh, and TiVo Big Shots this week- they have a song on the soundtrack! New Year’s Eve, here come the Mummies fans! I missed entirely the first opening act, and quite a bit of Ben Folds. The part of the set that I did catch was frankly not that good. The sound was bad (can any opening act get a good sound crew?? ), and when he started to riff on the keyboard, we all looked at each other wondering, “is this any good?” Carlton commented that he sounded like Ross. I was nonplussed. Since last year’s show, there has been a new album that is decidedly bluesey. I was excited to see the performance. As I commented last year, Mayer’s music has evolved from the poppy, earnest rock with great lyrics into … well, still great lyrics, but also John has evolved greatly as a musician. The set list was heavily new material. I wasn’t disappointed by his talented playing nor by the talent of the musicians surrounding him. The longer instrumental interludes- usually the part of a concert that I find most annoying- were incredible. During one solo, I picked up on some Tim Reynolds-style work with the electric guitar and pedal. But this was not about copying at all. John’s attitude seems to have evolved as well. He was humbly grateful, not quite as funny as usual, but very engaging. He didn’t talk to the crowd as much. 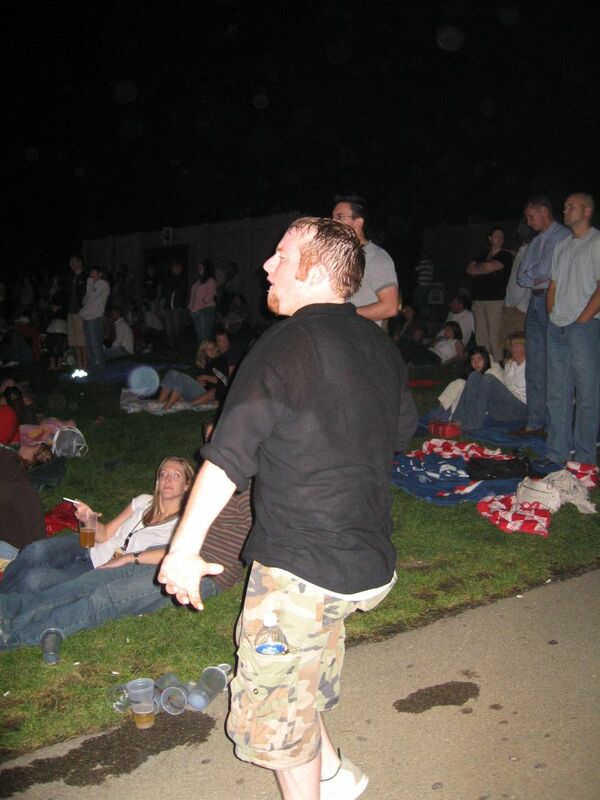 He did, however, insert a 20-second homage into one of his songs to the people with lawn tickets: this one’s for the people on the grass/Here’s to the people on the grass/I can’t see you but you can see me and I can feel you/ Oh yeah, the people on the grass. It was done in sort of a rap style as he played and it was funny and energizing. I could hear the lawn erupt in enthusiasm after the tribute. The best part of his gratitude was when he said that he’s very lucky and no different than the thousands of earnest musicians playing in bars everywhere. Kind of made me want to go see a less popular artist and experience something new. Anyway, the show was really good. Gravity was probably my favorite song that he played. I’m not a big fan of Waiting on the World to Change; I find the lyrics far too sad. I hate to think that we are so passive about making changes. Maybe I dislike it because it’s true. I went to a street festival called “Taste of Mass Ave.” I’ve always like Massachussetts Avenue for its galleries, eateries, and for the feel. Downtown Indianapolis proper- the blocks of Meridian between Market and Georgia- is a fun place. It has a lot to do but most of the featured places center around sports, shopping, and chain restaurants. Mass Ave offers more one-of-a-kind shops including fun galleries with the artist’s studio attached; clothing stores with tons of different designs; Indianapolis restaurants that use fresh, local produce in their menus. It shows that Indianapolis doesn’t have to import everything from other locales. So when I heard about the event, I really wanted to go. I find that I am inspired as an artist when I visit local galleries. The eclectic feel of Mass Ave sparks my creativity. I was disappointed from the beginning. The problem was that the event was sponsored by a local station, Radio Now 93.1, whose mix of music is hardly eclectic. I enjoy the station when I want to hear the latest pop song or if I need a retro hip-hop fix. The station also plays STUPID songs like Grillz and the equally lyrically challenged, pointless Shoulder Lean. The music being played was more along the lines of the latter. Radio Now didn’t consider the audience at all. The only really cool part of the music was a DJ mixing while two artists demonstrated graffiti art. The artists had amazing style; the one on the left was basically just doing a fancy tag, while the one on the right did a graffiti-style charicature of a sad man. I wanted to buy it, but it doesn’t quite fit my house. I was really hoping to see more art demonstrations and performance art, maybe even something interactive. So there was a group of people who wanted to hear Radio Now-style music and were nonplussed by the open galleries. There was another group of people who wanted to see local art and taste food from local restaurants, but couldn’t stand the music. If Radio Now had played some good crossover music they could have had a much better turnout. The food was overpriced (of course) and the beer was $4 for a crummy domestic. I expected a Taste of Mass Ave to have fun beer selections. Some food stands offered wines, but only one or two types. I saw a lot of people milling around, unsure what to think or what to do. After I cruised the art galleries and talked to some artists, I ended up leaving the festival to go sit in the Metro and have a drink while I waited for my friend Amy to show. By the time she arrived, I saved her the $5 entrance fee and we headed to Scholar’s Inn and had a bottle of wine with a couple of friends. The wine, by the way, was Greg Norman Shiraz 2002. The blackberry fruit led to vanilla warmth, slowly melting to creamy smooth tannin in the finish. The Cab percentage gave a hint of boldness, but it was more like strength, not overpowering pungency. I thought it was well-balanced and best drunk without food; it was somewhat mellow (like a lot of Shiraz). It couldn’t cut through the fat of the bread and butter I had with it. All in all, I did go out to Mass Ave whereas I would have stayed at home. However, Taste of Mass Ave has a lot of work to do to distiguish it from other festivals. Sometimes I think I live in this tiny little world and have no idea about anything. A cowboy with no horse; a deipnosophist with no drivel. I feel kinda like the day I first discovered Firefly. How have I never heard of this? And this, this is even more so. During my Gen Con carpool, I first heard of a little, tiny art show called Burning Man. After researching it, I realized that to call it "little" or a "show" or even merely "art" was a misnomer. It's like calling Gen Con a little gaming party. I started reading about Burning Man a couple of days ago and realized how left in the dust I am. I have an artist inside that craves to come out, but I never find the time. I pour my talent into other things: cooking, RPGs, even mini painting. Minis…well, sure, they're art, but let's not kid anyone: I get EXP from my GM too. Ever the multitasker am I. All of the art of mine that is on display in my house is at least ten years old. Then I hear of and read about this place where people not only view art, but live and breathe it to a level I can scarcely comprehend. I want to be challenged like that. I want to sit in front of a statue for three hours and not say a word. I want to stand in front of a light installation for 30 seconds and be unable to stop yammering because of the excitement. I want to talk art with artists and arties who know far more than I, and who can teach me so much. I want to feel awkward in the face of great art. Burning Man takes my emotions one step further and burns them. It's not a painting where I can look at one brushstroke, so lovingly placed, and my eyes well with tears. It is art that feeds on itself, and thus mirrors the fact that the art's experience is fed by those who experience it. Here I am on the raggedy edge of the emotions I feel and the sad hole where my artist's soul used to be. I am envious of those who allow themselves to go to this weeklong indulgence. I wish I could be as free. I wish I would let myself.